When Brian France came up with the idea of the Chase for the championship, it’s likely he never expected it would turn into not one, but two successful entities. The first time France brought up the idea of a NASCAR postseason in public was two days before the annual awards dinner in New York City in December of 2003. Drivers, teams, officials, media and sponsors were all gathering at the glamorous Waldorf-Astoria Hotel to honor Matt Kenseth on a championship season that was the essence of consistency – and perhaps the most boring title run in the long history of the stock car sport. Nobody could blame Kenseth, who put together a dream season for himself and his team, giving longtime car owner Jack Roush his first Cup championship after he had come agonizingly close a few times with Mark Martin. Kenseth’s one win, 25 top-10s and a finishing average of 10.2 in a 36-race season were solid enough that even a last-place finish in the finale at Homestead – thanks to a blown engine – left him 90 points ahead of runner-up Jimmie Johnson. There was little excitement as Kenseth built his advantage, and the new champion, obviously a nice guy, but quiet and kind of bland, didn’t generate much enthusiasm among the fans. Worse, it was the latest of a number of championships in a 10-year stretch that fizzled into one-man shows over the final races of the season. France, who succeeded his father, Bill France Jr., as CEO and chairman of NASCAR earlier in 2003, was looking for a way to make things more exciting, as well as finding a way to compete better against baseball’s postseason and the onset of college and professional football as the auto racing season was reaching its climax. His answer: The Chase for the championship – a playoff among the top 10 drivers in the points over the final 10 races of the season. The few media members on hand that night in New York weren’t exactly thrilled by the prospect. The traditionalists didn’t like the idea of changing the way the championship had been decided for years, some didn’t like the idea that the championship battle was being manipulated, and the rest weren’t convinced the fans would take the new format to heart. As everyone who pays attention to the sport knows, the Chase has generally been a success right from the beginning. That first 10-race title run in 2004 provided plenty of thrills before Kurt Busch gave Roush his second straight title. And, in the intervening years most of the championships have gone right down to the end, with at least two drivers in contention. France has made a few adjustments over the years, raising the number of drivers in the Chase to 12 and seeding them by wins during the “regular season,” and it all seems to have worked well. A funny thing has happened, though. 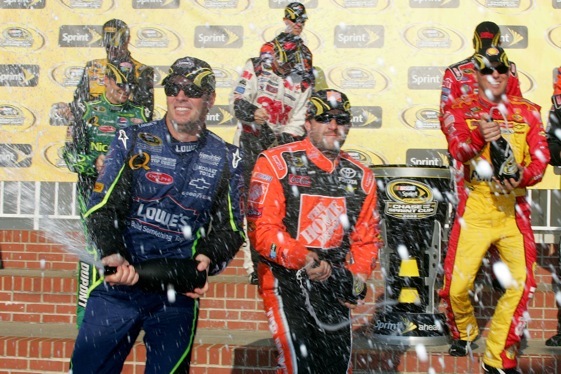 The so-called “race for the Chase”, the 26 races leading up to the NASCAR postseason, has become an event in its own right. From the time teams get back on track on Daytona in February, nearly everyone is talking points and who will be in the top 12 on a weekly basis. Reading the standings each week has become as important to many people are reading the race results. As the 26th race of the season, in Richmond, draws nearer, the pressure is on the drivers “on the bubble,’’ those near the bottom of the top 12 and those with at least a mathematical chance to get into the Chase. The last few weeks, virtually all anyone has wanted to talk about is whether Kyle Busch and Brian Vickers can somehow find their way into the top 12 in time, or whether Kenseth – who along with Johnson are the only drivers who have been in each of the first five postseasons – teammate Greg Biffle, Martin, Ryan Newman and Juan Pablo Montoya can hang on. Only 105 points separate those seven drivers heading into Saturday night’s decisive race in Richmond. Even Kurt Busch in seventh, Atlanta winner Kasey Kahne in sixth and Carl Edwards in fifth have yet to clinch spots in the Chase. And getting into the Chase, even without a championship, can make a driver, team and sponsor’s season. Missing out can be a disaster. Just ask team owner Richard Childress, who went from having three cars in the Chase last year to none in 2009. The pressure has been building and, the focus at Richmond won’t be on who will win the race. It will be on who will make the Chase – and who won’t. It may have been an unintended consequence of the Chase, but Brian France should be smiling as he watches the race Saturday night.